There are many gorgeous rivers in California that are perfect for camping and fishing, but none are located in Southern California. None! Yep, you read that right. If you think about it, the golden state is about half desert! The majority of our natural water in our state is coming from the north – so take this as a warning: you might need to drive a few hours to find your ideal river camp. The easy-to-access waterways are found mostly along highways in the Sierra Nevada – or way up in NorCal. Deep granite gorges carved out by glaciers, surrounded by forested peaks is only half the appeal. High elevation lakes, waterfalls, big trees, abundant wildlife, and the alpine villages are all part of the Sierra Nevada experience. Raft, kayak, fly fish, hike, bike or just camp out next to a big, rushing, flowing river. Our selection of California maps will get you narrowed down to a specific region, so you can find that perfect river campground, or explore and discover the back roads – for the most seclusion. 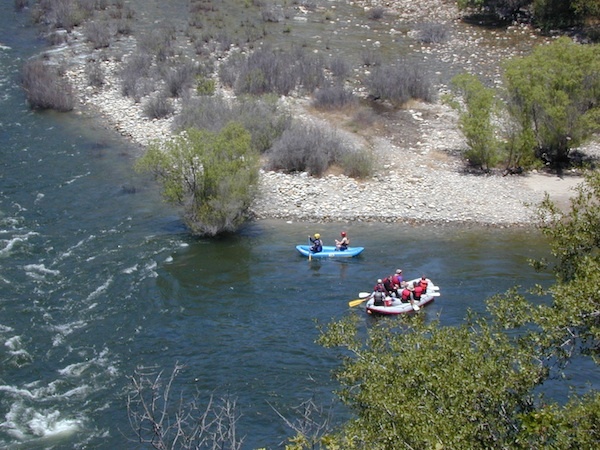 KERN RIVER: The Kern River is one of the most popular of all the Sierra rivers due to its proximity to SoCal. Hurried, stressed-out, Angelinos (LA) can be at this destination in under 3 hours which makes it a very busy place most warm months. So, let it be told, that summer is not the best time to enjoy the Kern. If you do plan a summer outting, make sure you head for the Upper Kern (10+ mi N of Kernville & Lake Isabella) or the North Fork of the Kern (out in Monache Meadows) where 4×4 is often needed. The Lower Kern River has only 2 developed campgrounds: Hobo (closed for winter) and Sandy Flat (open all year). Numerous primitive camp spots are available along Old Kern Canyon Rd, which parallels the Hwy 178 on the south side. None of which are located at the rivers edges. Fire danger is great in this area, so pay extra close attention to signs and fire restrictions. YOSEMITE RIVER: Take note, this is the most popular park in the whole state. 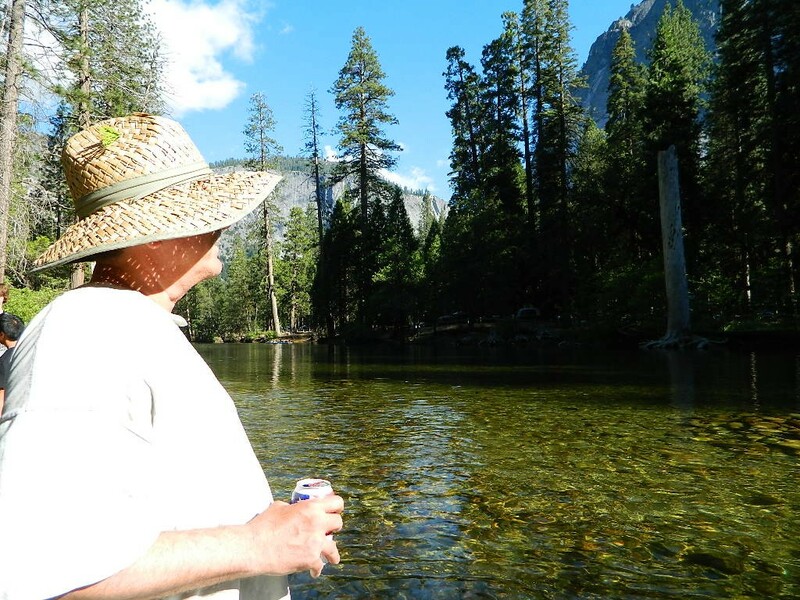 The majority of campers want to stay right on the river when they visit Yosemite National Park, but that is just plain old impossible, since reservations go fast and there is only so much room for everyone in this enclosed, narrow, precious valley. This particular park has some major floods (1997 & 2005) that wipe out bridges, the road ways, all the old wooden cabins (at Yosemite Lodge) are gone and only half of the campgrounds are still available. Yosemite has had 11 winter floods since 1916 that have caused substantial damage to property. 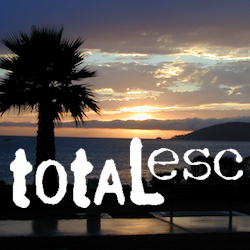 Reservations are taken for camping and cabins – far in advance; like one year. No joke! Way up in the Yosemite high country which is only open a few months outta the year, the beautiful Tuolumne Meadows Campground is located next to lush meadows and the scenic Tuolumne River. All Yosemite campsites must be reserved well in advance, so click the links above – if you are serious about a Yosemite camping trip. 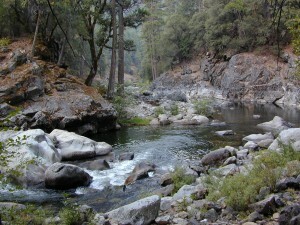 STANISLAUS RIVER: The Sonora Pass, the fishing is very decent way back in this granite gorge. The highway 108 is only open a few months outta the year, due to snow & rock slides – so time is of the essence. Summer time that is. Several campgrounds are located right on the river, or on the major feeder streams. Or you can opt for secluded primitive camping on the back roads. 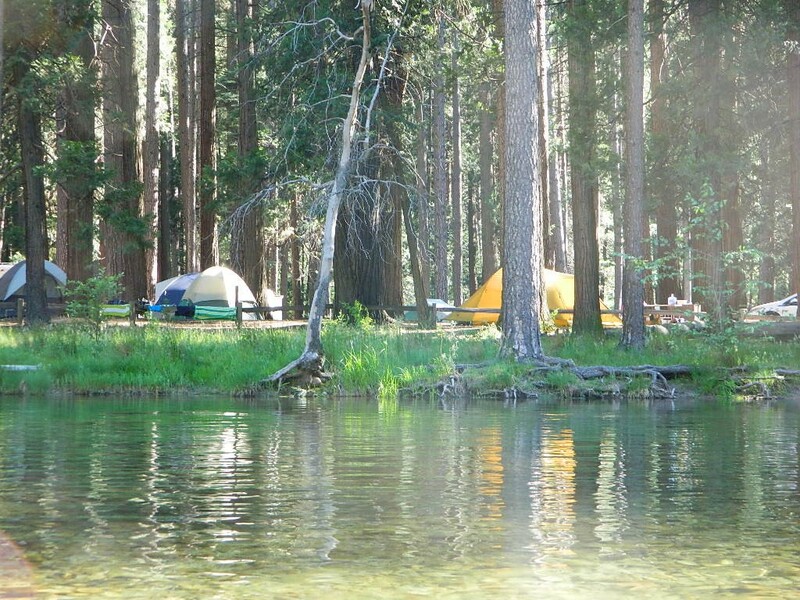 Find Sonora camping in Stanislaus National Forest. YUBA RIVER: The biggest play time river in the northern Gold Country, this runs along Hwy 49 near Downieville and also has a major South Fork for the best swimming holes and primitive camping in this region. Tubing, rafting, kayaking, fishing, camping, gold panning, you name it, Yuba has it. Look for more on the South Yuba Recreation map, or Plumas National Forest map. FEATHER RIVER: The top fishing river in the Lassen – Lake Oville area. Chester and Lake Almanor in the upper reaches. High Bridge Campground is nice paved-camp-site camping; a forested spot where you can fish 2 rivers on the same day. A Plumas NF or Lassen NF map would be quite helpful for this region. Lower down the mountain, lower Feather Rivers which include all 4 forks which feed Lake Oroville – West Fork, North Fork, Middle Fork Feather, and the South Fork. Lots of waterways to explore in between Chico and Quincy. KINGS RIVER: This one particular river is the longest in the Sierra Nevada mountain range, pulling snow melt from the upper reaches of the High Country and Mount Whitney. 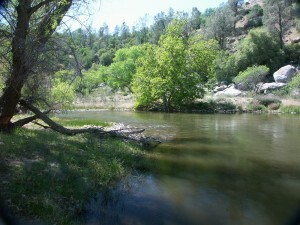 The river area just to the West of the National Park, over to Pine Flat Reservoir, is all prime for outdoor recreation. Several river rafting companies work this stretch of river.